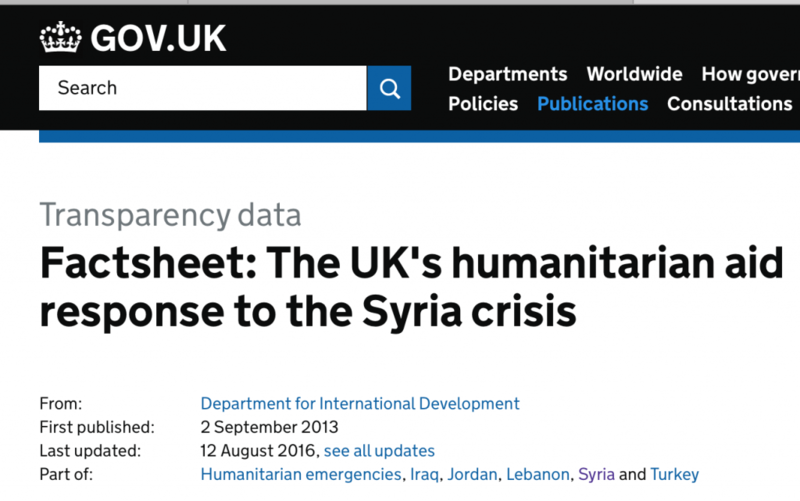 A document (1, pdf) produced last December by the UK Foreign and Commonwealth Office, headed: “ UK Humanitarian Aid in Response to The Syria Conflict”, makes interesting reading. Thus the UK government is overtly supporting the illegal overthrow of yet another sovereign government. 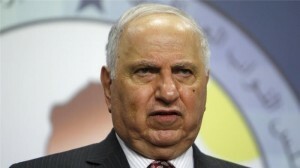 This all reads like a re-run of Ahmed Chalabi’s (image right) Iraq National Congress and Iyad Allawi’s Iraq National Accord, backed by the British and US governments to equally criminally overthrow Saddam Hussein. Iraq’s football pitches, gardens and back yards turned graveyards, probably three million deaths between the embargo, the 1991 thirty two country assault, the 2003 blitzkrieg and invasion – ongoing – the ruins of the “Cradle of Civilisation” of which Syria is equally custodian, are silent witness to that gargantuan crime against humanity – and history. Will Washington and Whitehall never learn – or is destruction of civil societies, Nazi-like aggression, illegal overthrows and rivers of blood their raison d’être? Incidentally, Foreign Office accounting farcically includes: “more than £29 Million to reduce the impact of the conflict on the region.” Stopping dropping British bombs would surely be the most practical way to do that – and persuading their US “coalition partners” to do the same. Yet more nauseating, murderous, hypocrisy. Also, near farcically, the Foreign Office informs: “We have also funded Law of Armed Conflict training to help commanders train their fighters to understand their responsibilities and obligations under international human rights and humanitarian law.” Given their track record of near unique, mediaeval barbarity, the “training” is clearly falling on deaf ears. Disband the police, army, all structures of State – and Iraq is the soul searing, haunting, admonishing ghost, mourning the vibrant, cohesive, civil society (for all its complexities, as most societies) it was prior to the embargo and Iraq Liberation Act (1998) which stated that: “It should be the policy of the United States to support efforts to remove the regime headed by Saddam Hussein from power in Iraq…” and signed into law on 31st October 1998, by President Bill Clinton. As mentioned previously, there is now of course the Syria Accountability and Liberation Act of 2010 (H.R. 1206.) Spot the parallels. 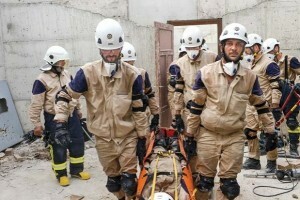 “The White Helmets” have also benefitted from $23 million from the US, according to State Department spokesman, Mark Toner (27th April 2016) and €4 million from the government of the Netherlands. Last week Germany announced increasing this year’s donation to ‎€7 million. Japan has also chipped in. 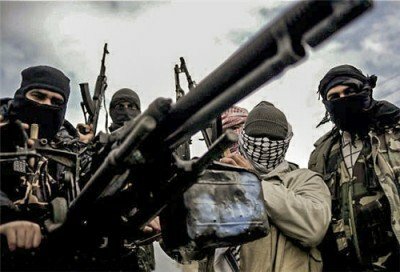 A great deal of money, it would seem, is being thrown at insurgents and illegal immigrants in a sovereign country, awarding themselves the title of Syrian Civil Defence. Yet they do not even have an emergency telephone number. As Vanessa Beeley (5) has pointed out in extensive writings on the subject, the real Syria Civil Defence was established in 1953, is a Member of the International Civil Defence Organisation whose partners include the UN Department of Humanitarian Affairs – and as all national emergency services, they have a telephone number: 113. 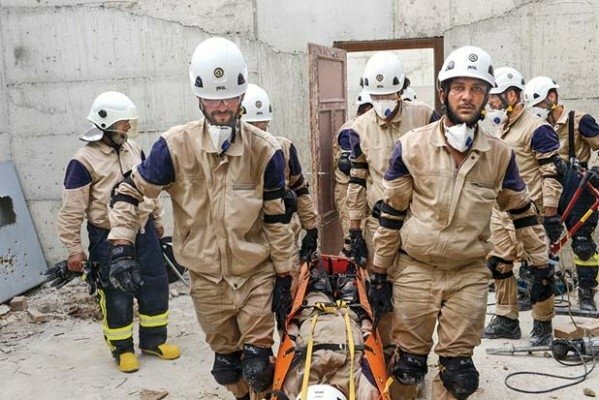 Among the myriad tasks the “White Helmets” claim to undertake is: “The provision of medical services – including first aid – at the point of injury.” Why then were they trained not by expert first responders, paramedics, civil emergency operatives, but by a mercenary, sorry “private contractor”? “Democratisation programmes” eh? George Orwell’s “Nineteen Eighty-four” had a “Re-education Committee”, but let’s not get too carried away. On Tuesday 11 October 2016, the UK’s arguably combative Andrew Mitchell MP, ex-Royal Tank Regiment, who allegedly called Downing Street Police after an altercation “f ***** g plebs”, was granted an emergency three-hour debate in the House of Commons on Syria after allegations by the ‘White Helmets’ that Russian military jets and Syrian helicopters were bombing civilians in eastern Aleppo. Again of course, all but Russian and Syrian aircraft are there illegally, but Andrew Mitchell is being advised among others by former CIA Director General David Petraeus, who was also former Commander of US Forces in Afghanistan and of Multinational Forces in Iraq. Not really a mini think tank, some might speculate, where the rule of law is going to have highest priority. Incidentally, there are rigid protocols for first responders, paramount among which is to protect the injured, the traumatized, from publicity and identification, in their vulnerability.